Purpose: The current study aimed to evaluate hearing-related changes in terms of speech-in-noise processing, fast-rate speech processing, and working memory; and to identify which of these three factors is significantly affected by age-related hearing loss. Methods: One hundred subjects aged 65–84 years participated in the study. They were classified into four groups ranging from normal hearing to moderate-to-severe hearing loss. All the participants were tested for speech perception in quiet and noisy conditions and for speech perception with time alteration in quiet conditions. Forward- and backward-digit span tests were also conducted to measure the participants’ working memory. Results: 1) As the level of background noise increased, speech perception scores systematically decreased in all the groups. This pattern was more noticeable in the three hearing-impaired groups than in the normal hearing group. 2) As the speech rate increased faster, speech perception scores decreased. A significant interaction was found between speed of speech and hearing loss. In particular, 30% of compressed sentences revealed a clear differentiation between moderate hearing loss and moderate-to-severe hearing loss. 3) Although all the groups showed a longer span on the forward-digit span test than the backward-digit span test, there was no significant difference as a function of hearing loss. Conclusion: The degree of hearing loss strongly affects the speech recognition of babble-masked and time-compressed speech in the elderly but does not affect the working memory. We expect these results to be applied to appropriate rehabilitation strategies for hearing-impaired elderly who experience difficulty in communication. Numerous studies have demonstrated an aging effect on speech recognition, but they have not explored the effect of hearing loss in the elderly. In other words, elderly listeners with different hearing loss do not have the same difficulty in understanding speech.6 For example, an elderly person with mild hearing loss might not have a problem in a fast-speech environment, but could have considerable difficulty in a noisy one. Furthermore, little attention has been paid to mild and moderate hearing loss, although signs of age-related hearing loss are usually expected with this degree of loss. Again, it is important to scrutinize how age-related hearing loss can result in proportionate difficulty in understanding speech among the elderly.8 The present study aimed to assess hearing-related changes in speech recognition based on three factors – speech in noise, fast-rate speech, and working memory – and to identify which of these factors is strongly affected by presbycusis. Elderly people recruited from the Chuncheon community participated voluntarily in this study. After being administered the Korean version of the Mini Mental State Examination (MMSE-K),17 only the people who met the normal criterion of MMSE-K (ie, a minimum score of 25 out of 30) were included. These participants reported no experience of ear surgery or any age-related chronic disease. Consequently, 100 elderly subjects (54 males and 46 females) participated. Their average age was 74.68 years (range: 65–84 years). Tympanometry and pure-tone audiometry were tested for hearing screening, and then the subjects were divided into four groups based on their average threshold of 0.5, 1, 2, and 4 kHz, respectively. Among them, 26, 24, 28, and 22 subjects were designated as normal hearing, mild, moderate, and moderate-to-severe sensorineural hearing loss, respectively. Fourteen had worn hearing aids for <3 years: 4 for moderate and 10 for moderate-to-severe hearing loss. The four groups comprised 13, 16, 14, and 12 male participants, and the average age of each group was 74.00±5.43, 74.96±5.61, 74.57±5.09, and 75.18±5.58 years, respectively. Although gender was not equally distributed, there was no significant difference of age across the groups (F(3, 96) =2.061, P=0.111). 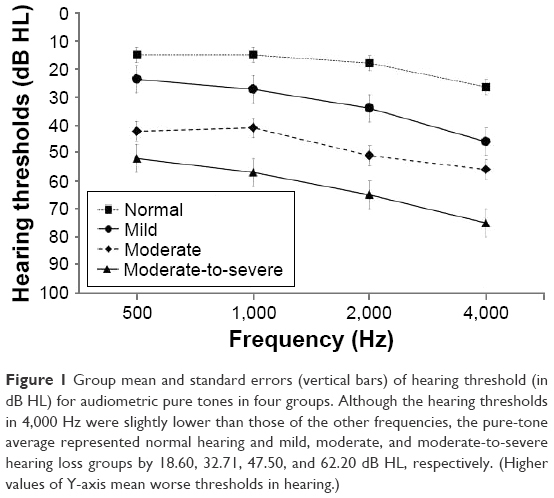 Figure 1 shows the hearing threshold as a function of frequency for the four groups. All subjects signed an informed consent form before participating in the experiments. The study was approved by the Institutional Review Board of Hallym University. To evaluate speech perception under noise conditions, the Korean Speech Perception in Noise (KSPIN)18 was performed at the most comfortable level (MCL) for each subject with no noise (ie, quiet condition) and with two levels of noise composed of 20 multi-talkers’ babble (ie, +3 and 0 dB signal-to-noise ratios, SNRs). The presentation level of the KSPIN was initially set to the subject’s MCL in quiet and then adjusted under noise so that the sentences were equally loud independent of SNR. The test consisted of 40 sentences from a list and examined each condition. Sentence materials of Korean Speech Audiometry (KSA)19 were provided to measure speech perception ability under the fast-rate speech condition. To create two time-compressed conditions, 15% and 30%, Adobe Audition (v. 5.0; Adobe Systems, Inc., San Jose, CA, USA) was used. For the created conditions, the root mean square was applied to adjust the amplitude of each sentence, but the inherent characteristics of words, including fundamental frequencies, remained fixed. In the measurements of speech in noise and fast-rate speech, the sentences were produced by a female speaker recorded on a compact disk. Finally, the short-term and working memory capacity was assessed by the digit-forward and digit-backward span test. Both the tests consisted of a string of consecutive numbers from 0 to 9 in random order. One tester presented the test while maintaining a regular 1-second interval between number presentation. The participants were tested for speech perception in noise using KSPIN sentences in quiet, noisy (+3 dB SNR), and very noisy (0 dB SNR) conditions. They were also tested for speech perception under three conditions for speech rating: normal (0% compression), slightly fast (15% compression), and fast (30% compression) using the KSA sentences. During both the measurements, the participants were asked to listen to sentences played on the CD and then repeat them. A trained audiologist calculated total scores as percentages. Then the working memory capacity was measured by using forward- and backward-digit span in which the participants were asked to recall as many numbers as possible in order and in reverse order while listening to consecutive numbers. The test began with two to three consecutive numbers, increasing until the participant committed an error. The digit span defined the level at which 50% of the numbers was repeated.20 All three measurements were made by a presentation level of each subject’s MCL through a loud speaker located in 0 degree azimuth and 1 m distance from the subject. The speaker was connected to an audiometer (Model GSI 61; Grason-Stadler, Eden Prairie, MN, USA) in a sound isolation chamber. Statistical analysis was performed using SPSS software (version 20; IBM Corporation, Armonk, NY, USA). The within-subject factors were noise levels (quiet, +3, and +0 dB SNR), time compression (0%, 15%, and 30%), and digit span (forward- and backward-digit tests), and the between factor was four groups with hearing loss. To find the main effect and interaction between the factors, each factor was analyzed by two-way analysis of variance (ANOVA) with repeated measure. If necessary, Scheffe post-hoc corrections were applied with multiple comparisons. The criterion used for statistical significance in this study was P<0.05. The ANOVA confirmed a significant main effect for degree of noise (F(2, 192) =188.937, P≤0.001) and degree of hearing loss (F(3, 96) =20.124, P≤0.001). In the degree of noise, the quiet condition (mean: 86.90, SD: 1.24) showed a significantly higher percentage of scores than the +3 dB SNR (mean: 60.45, SD: 2.35), which was significantly higher than that in the 0 dB SNR condition (mean: 44.42, SD: 2.41). For degree of hearing loss, normal hearing groups (mean: 82.63, SD: 3.58) showed significantly higher scores than the three hearing-impaired groups. The mild hearing-impaired group (mean: 68.28, SD: 3.01) did not differ significantly from the moderate group (mean: 57.76, SD: 3.22), but was significantly higher than the group with moderate-to-severe hearing loss (mean: 47.03, SD: 3.22). No significant difference was observed between the groups with moderate and moderate-to-severe hearing loss. Figure 2 indicates the average correct percentage for sentence identification of the four groups in three conditions while providing results of the post hoc test. In the quiet condition, the normal hearing, mild, moderate, and moderate-to-severe groups had 93.41% (SD: 3.67), 91.54% (SD: 6.57), 85.62% (SD: 8.83), and 77.05% (SD: 18.87) perception scores (P<0.05), respectively. 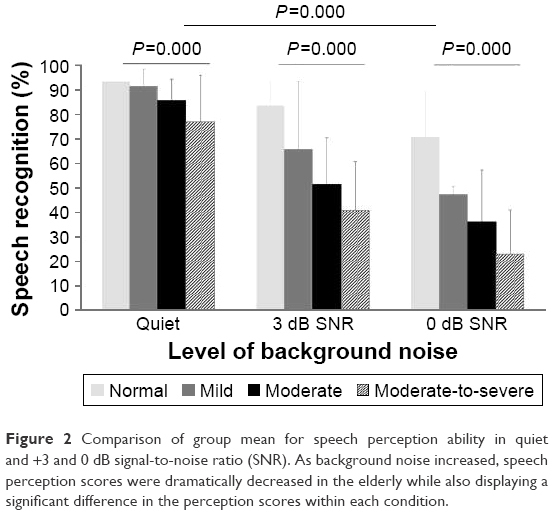 In the noise condition of +3 dB SNR, speech perception scores decreased in all the groups (P<0.05). For example, the four groups scored 83.65% (SD: 11.54), 65.71% (SD: 28.16), 51.43% (SD: 19.36), and 41.00% (SD: 19.64). As noise increased, the four groups showed deteriorated perceptual scores, with 70.82% (SD: 19.11), 47.58% (SD: 26.59), 36.24% (SD: 21.36), and 23.05% (SD: 17.84) in those groups (P<0.05). Figure 2 Comparison of group mean for speech perception ability in quiet and +3 and 0 dB signal-to-noise ratio (SNR). As background noise increased, speech perception scores were dramatically decreased in the elderly while also displaying a significant difference in the perception scores within each condition. The interaction of degree of noise and degree of hearing loss (F(6, 192) =1,375.631, P≤0.001) was significant. That is, although the speech perception score of normal hearing group gradually decreased from 93.41% in quiet to 83.65% and 70.82% in +3 and 0 dB SNR, respectively, the speech perception scores of the three hearing-impaired groups dramatically decreased with increased noise conditions. A significant main effect of compression rate (F(2, 192) =18.719, P≤0.001) and degree of hearing loss (F(3, 96) =10.643, P≤0.001) was observed. The normal speech rate (mean: 95.17, SD: 0.97) was significantly higher than the 15% compression (mean: 93.43, SD: 0.90), which was significantly higher than the 30% compression (mean: 87.91, SD: 1.68). In the level of hearing loss, both normal hearing (mean: 98.80, SD: 2.21) and mild hearing loss groups (mean: 95.57, SD: 1.86) showed significantly higher scores than the moderate-to-severe group (mean: 83.48, SD: 1.99). However, there was no significant difference among the other groups. Figure 3 illustrates bar graphs for the mean of the total percentage correct for the four groups in three conditions, based on the results of the post hoc test. In a normal speech rate (0% compression), the four groups had 99.29% (SD: 1.69), 97.29% (SD: 3.35), 94.24% (SD: 7.24), and 89.86% (SD: 15.30) perception scores, respectively, but no significant group difference was found (P>0.05). Under the 15% compression condition, the groups scored 98.94% (SD: 2.46), 97.58% (SD: 2.84), 92.48% (SD: 6.88), and 84.71% (SD: 14.20), respectively. Although there was no significant difference in perceptual scores between the normal hearing and mild hearing loss groups, the groups with mild to moderate-to-severe hearing loss revealed a meaningful difference at 15% compressed speech (P=0.024). With 30% compression, the normal hearing and mild hearing loss groups still had high scores of 98.18% (SD: 2.74) and 91.83% (SD: 18.26), respectively, while the moderate and moderate-to-severe groups had slightly decreased speech perceptual scores, at 85.76% (SD: 13.72) and 75.86% (SD: 18.33), respectively. Four groups showed a significant difference in speech perception scores (P=0.003). 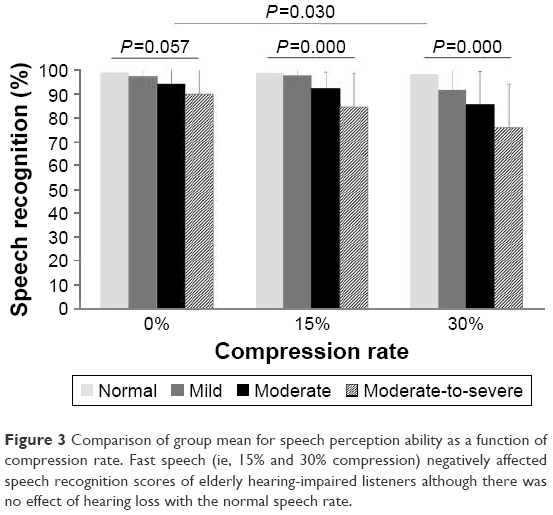 Figure 3 Comparison of group mean for speech perception ability as a function of compression rate. Fast speech (ie, 15% and 30% compression) negatively affected speech recognition scores of elderly hearing-impaired listeners although there was no effect of hearing loss with the normal speech rate. A significant interaction was seen between the levels of fast-rate speech and levels of hearing loss (F(6, 192) =151.083, P=0.030). Although the group with normal hearing was not affected by the speech rate, the mild and moderate hearing loss groups showed much decreased speech scores in the 30% compression (91.83% and 85.76%) versus the 15% compression condition (97.58% and 92.48%). The speech perception scores of the group with moderate-to-severe hearing loss did change dramatically from 0%, 15%, and 30% conditions at 89.86%, 84.71%, and 75.86%, respectively. To examine the significance of the main effect for working memory, ANOVA was conducted on digit span (F(1, 96) =214.501, P≤0.001). The forward-digit span (mean: 4.75, SD: 0.12) was longer than the backward-digit span (mean: 3.10, SD: 0.08). However, there was no significant difference in the group mean (F(3, 96) =0.543, P=0.654) and no interaction between the digit span and group (F(3, 96) =0.993, P=0.401). Figure 4 presents the average length of the span for the four groups in two conditions. For the forward-digit span, the normal hearing and mild, moderate, and moderate-to-severe hearing loss groups had the average length of the span of 5.00 (SD: 0.93), 4.63 (SD: 0.77), 4.81 (SD: 1.36), and 4.57 (SD: 1.08), respectively. In the backward-digit span, the normal hearing and mild, moderate, and moderate-to-severe groups had the average length of the span of 3.24 (SD: 0.75), 3.17 (SD: 0.70), 2.90 (SD: 0.62), and 3.10 (SD: 0.83), respectively. Figure 4 Comparison of group mean for digit span test. 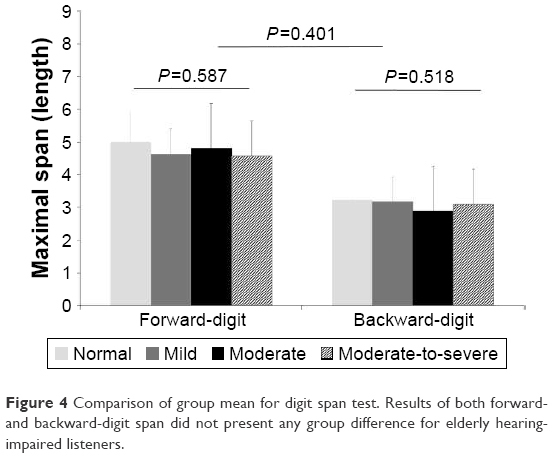 Results of both forward- and backward-digit span did not present any group difference for elderly hearing-impaired listeners. According to the Working Group on Speech Understanding and Aging Committee on Hearing, Bioacoustics, and Biomechanics, the underlying reasons for age-related auditory defects are likely related to changes in the peripheral auditory system, central auditory processing, and cognitive performance.21 This means that age-related degradation in speech understanding might be the complex result of numerous factors. The present study was designed to investigate which major factors of speech recognition can be affected by the degree of hearing loss in the elderly. Gordon-Salant and Fitzgibbons indicated that elderly listeners with and without hearing loss had some difficulty in recognizing rapid speech.24 However, our data showed that the degree of age-related hearing loss in understanding temporally distorted speech may be a key. As one possibility for these contradictory findings, their study used selective time compression for consonants, vowels, or pauses instead of controlling overall sentences as we did. Peripheral effects may cause a sensory coding problem arising from sensorineural hearing loss and/or supra-threshold processing of short-term spectral, durational, and intensive attributes of phonetic elements,24 whereas problems associated with central timing mechanisms are more likely to influence judgments about stimulus duration and/or the perception of supra-segmental prosodic attributes of speech tempo and rhythm.16 Thus, subjects with normal hearing and mild hearing loss were less affected by central timing mechanisms in our study. Among the cognitive abilities related to the processing of speech, working memory capacity has received much attention and the deficit of working memory capacity with age is well explained.24 However, working memory did not differ with the level of hearing loss in our elderly subjects, and controversy still remains about the exact contribution of hearing sensitivity and working memory to speech recognition. Limitations in the measurement of working memory warrant further research. First, we may have restricted the possible variability because of testing only subjects with good cognitive function passing the normal criteria of MMSE-K. A second issue stems from not including young listeners as counterparts of our subjects. We need to confirm more obvious working memory functions in the degree of hearing loss in presbycusis while comparing elderly listeners to young listeners with similar hearing loss. Third, although the digit span is a widely used neuropsychological test for measuring short-term verbal memory,14,22 we need to understand the difference between our results using digit span and results using different test materials. The present study failed to detect any difference in working memory associated with the degree of hearing loss because the digit span test was not sufficiently sensitive to measure it. However, like Pichora-Fuller et al, who measured working memory span for young and old subjects who were required to understand sentences in various SNR conditions while simultaneously storing sets of sentence-final words for later recall,8 we expected to see an effect of degree of hearing loss if applied to noise. The effects of hearing loss were best seen in the results of fast-rate speech in the elderly. Speech perception ability in noise was deteriorated for elderly listeners with normal hearing, although the scores were much decreased as a function of noise with larger hearing loss, which might be explained by the aging effect rather than the hearing loss. As a possible clinical application, speech recognition in a noise environment, which is a major problem for elderly listeners, should be emphasized in aural rehabilitation sessions. We are grateful to our subjects for their voluntary participation and their time for this experiment. This work was supported by Hallym University Research Fund (HRF-201611-007) and the Ministry of Education of the Republic of Korea and the National Research Foundation of Korea (NRF-2015S1A3A2046760). Lin FR, Thorpe R, Gordon-Salant S, Ferrucci L. Hearing loss prevalence and risk factors among older adults in the United States. J Gerontol A Biol Sci Med Sci. 2011;66(5):582–590. Meister H, Schreitmuller S, Grugel L, Beutner D, Walger M, Meister I. Examining speech perception in noise and cognitive functions in the elderly. Am J Audiol. 2013;22:310–312. Amos NE, Humes LE. Contribution of high frequencies to speech recognition in quiet and noise in listeners with varying degrees of high-frequency sensorineural hearing loss. J Speech Lang Hear Res. 2007;50:819–834. Humes LE, Roberts L. Speech-recognition difficulties of the hearing-impaired elderly: the contributions of audibility. J Speech Hear Res. 1990;33:726–735. Sommers MS. Speech perception in older adults: the importance of speech-specific cognitive abilities. J Am Geriatr Soc. 1997;45:633–637. van Rooij JC, Plomp R. Auditive and cognitive factors in speech perception by elderly listeners. III. Additional data and final discussion. J Acoust Soc Am. 1992;91:1028–1033. Humes LE. The contributions of audibility and cognitive factors to the benefit provided by amplified speech to older adults. J Am Acad Audiol. 2007;18:590–603. Pichora-Fuller MK, Schneider BA, Daneman M. How young and old adults listen to and remember speech in noise. J Acoust Soc Am. 1995;97(1):593–608. Picholar-Fuller MK, Singh G. Effects of age on auditory and cognitive processing: implications for hearing aid fitting and audiologic rehablitation. Trends Amplif. 2006;10(1):29–59. Vaughan NE, Letowski T. Effects of age, speech rate, and type of test on temporal auditory processing. J Speech Lang Hear Res. 1997;40(5):1192–1200. Lavie L, Banai K, Attias J, Karni A. How difficult is difficult? Speech perception in noise in the elderly hearing impaired. J Basic Clin Physiol Pharmacol. 2014;25(3):313–316. Lee JH. Age-related deficits in the processing of fundamental frequency differences for the intelligibility of competing voices. Korean J Audiol. 2013;17(1):1–8. Gordon-Salant S, Fitzgibborn PJ. Effects of stimulus and noise rate variability on speech perception by younger and older adults. J Acoust Soc Am. 2004;115(4):1808–1817. Cervera TC, Soler MJ, Dasi C, Ruiz JC. Speech recognition and working memory capacity in young-elderly listeners: effects of hearing sensitivity. Can J Exp Psychol. 2009;63(3):216–226. Cohen G. Inferential reasoning in old age. Cognition. 1981;9:59–72. Light LL, Zelinski EM, Moore M. Adult age differences in reasoning from new information. J Exp Psych Learn Mem Cog. 1982;8:435–447. Kwon YC, Park JH. Korean version of mini-mental state examination (MMSE-K). Part I: development of the test for the elderly. J Korean Neuropsychiatr Assoc. 1989;28:125–135. Kim JS, Bae SY, Lee JH. Development of a test of Korean speech intelligibility in noise (KSPIN) using sentence materials with controlled word predictability. Korean J Speech Sci. 2000;7(2):37–50. Jang HS, Lee JH, Lim DW, Lee KW, Jeon AR, Jung EJ. Development of Korean standard sentence lists for sentence recognition tests. Audiol. 2008;4:161–177. Richardson JT. Measures of short-term memory: a historical review. Cortex. 2007;43(5):635–650. CHABA. Speech understanding and aging. Working Group on Speech Understanding and Aging. Committee on Hearing, Bioacoustics, and Biomechanics, Commission on Behavioral and Social Sciences and Education, National Research Council. J Acoust Soc Am. 1988;83(3):859–895. Hwang JS, Kim KH, Lee JH. Factors affecting sentence-in-noise recognition for normal hearing listeners and listeners with hearing loss. J Audiol Otol. 2017;21(2):81–88. Jin S-H, Liu C, Sladen DP. The effects of aging on speech perception in noise: comparison between normal-hearing and cochlear-implant listeners. J Am Acad Audiol. 2014;25:656–665. Gordon-Salant S, Fitzgibbons P. Sources of age-related recognition difficulty for time-compressed speech. J Speech Lang Hear. 2001;44:709–719.